Haiku by J.D. Heskin (USA). Artwork by myself. 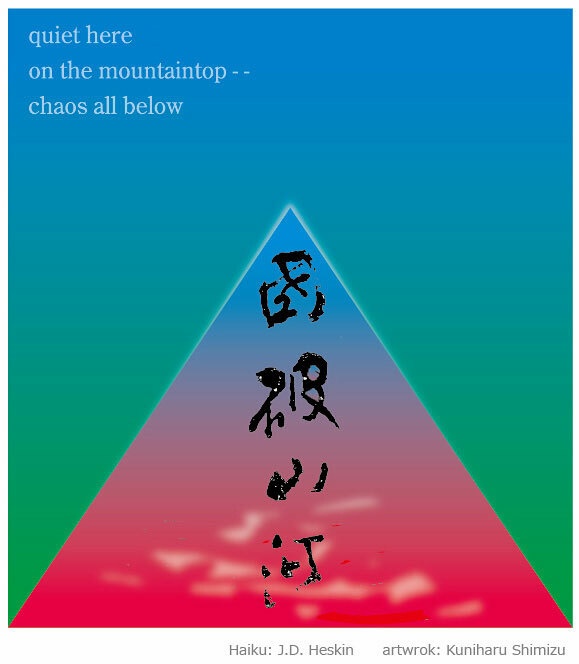 The kanji in the haiga are the first four kanji from a poem by a prominet Chinese poet, Du Fu ( 杜甫 ), (712–770). They mean, a country was defeated, but moutains and rivers still remained. One kanji is missing but still the meaning is obvious. This is a famous poem that anyone who attended high school in Japan know it. The poem came to my mind when I read the haiku by Heskin so I added it to this haiga. 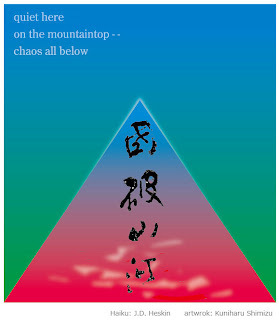 I think the complex images of the kanji contrast well with the minimally simple image of the rest of the haiga. I think you mean "quiet"
Um imagem recorrente para quem deseja se livrar do Caos. Mas, de certo modo, o Caos também é experiência necessária aos homens e, por isso, merece ser vivido. "Chaos is also necessary experience to men and therefore deserves to be lived"